Rabies is a serious viral infection that targets the brain and nervous system. Rabies is contracted via a bite, scratch or saliva (on open wounds) from an infected mammal. The most common animals which can pass on rabies are bats, cats, dogs and monkeys. Unless treated very early rabies is nearly always fatal. 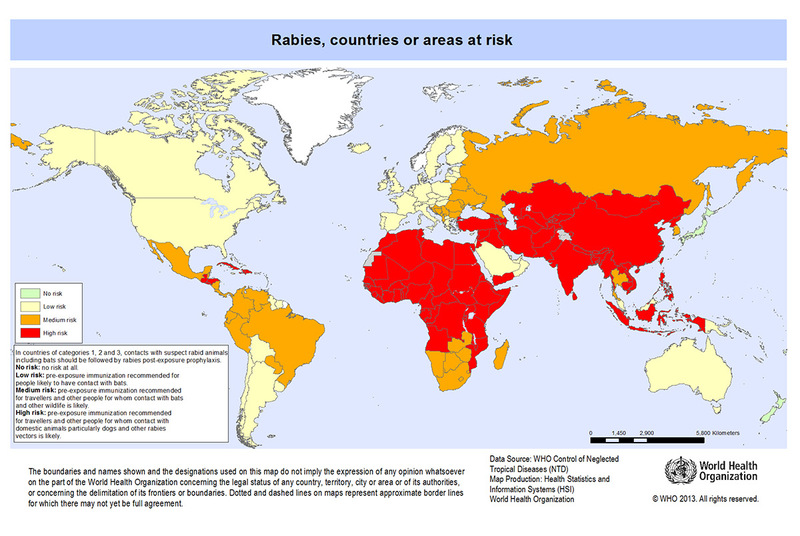 Countries at risk Rabies occurs worldwide with the exception of Antartica. Low risk areas include North America,Australia, Europe and Japan with the rest of the world being medium to high risk. It is important to avoid touching or petting any animals while abroad. Make sure any cuts and open wounds are bandaged up. Symptoms of rabies may take a while to develop and include tingling and itchiness at the site of infection, fever, an irrational fear of water and aggressive behavior. Once symptoms present however the disease is nearly always fatal. The rabies vaccination consists of three doses over a minimum of 21 days. Once the first vaccination is completed the second vaccination is done 7 days later and the third dose 14 days after the second dose. If you do come into contact with an animal that has bitten or scratched you it is vital to seek medical attention as soon as possible. If you have not had any pre-exposure rabies vaccination then you must seek medical attention within 24 hours. If the three vaccinations were completed before travel then it is still vital to seek medical attention however it gives you an extra 24 hours to get to hospital and you only require two extra vaccinations compared to five vaccinations plus a blood transfusion if no vaccinations were completed beforehand.